“Coomb” may have been chosen to serve as a rhyme for “gloom,” which is an extremely important word in this poem: it cancels the hope of the last line. One of the Polish Christmas carols also mentions the cattle kneeling down (possibly the entire livestock is included in the plural of “cattle,” but not everyone had sheep). 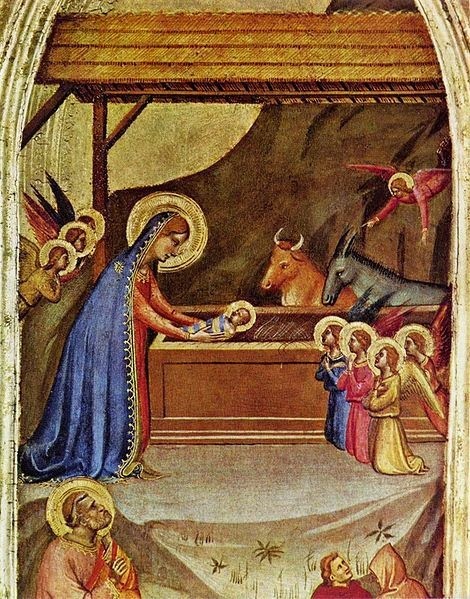 Furthermore, at midnight on Christmas Eve the cattle can speak and are proclaiming “miracles.” The point was that all of nature recognizes and celebrates the birth of the Holy Child. Of course not: in the 20th century, the age of science, no one would weave a tale of that sort. Also, Hardy wrote this poem after the outbreak of WWI, another example of Christian ideals appearing to be a never-achieved fairy tale while bishops blessed the cannons. But speaking of weaving, I just learned that allegedly Poles used to believe that a spider wove a blanket for Baby Jesus, so it was good luck to see a spider on Christmas. My grandmother knew this kind of lore — she still referred to date according to the feast-days of the saints, e.g. “I last saw Zula just before St. Michael’s.” But not a word about a divinely inspired spider weaving a blanket for Baby J. Maybe it was a regional Christmas legend — if such a legend really exists, that is. (In an era when more and more scholars incline to the view that Jesus never existed, but was a fictional character like Odysseus [see http://www.rawstory.com/rs/2014/08/did-historical-jesus-exist-growing-number-of-scholars-dont-think-so/ ], we don’t just question history; even the authenticity of certain legends is subject to doubt. 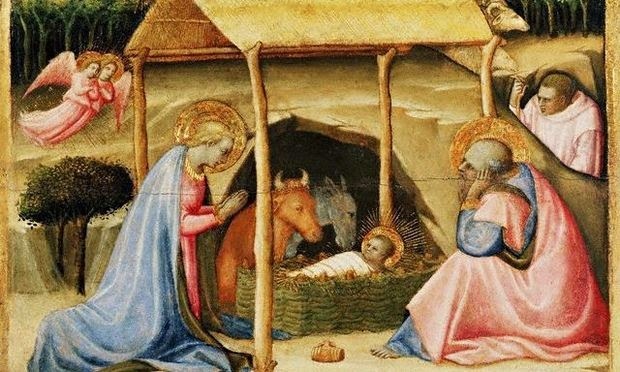 The common belief was that Mary used straw to keep the baby warm in the manger (except that birth usually took place in a crowded family room: http://www.theguardian.com/world/2014/dec/23/jesus-christ-not-born-in-stable-theologian-new-testament). A spiderweb blanket — who knows, it might be the next kevlar! But never mind cattle, sheep, and blanket-weaving spiders — though the tradition certainly shows an endearing involvement of animals in the birth of Christ. Pope Benedict’s misguided directive to remove the animals from Nativity scenes because of the absence of scriptural evidence shows a scholastic mind that follows the letter and not the spirit. The directive was politely disregarded. Of course the animals were there! 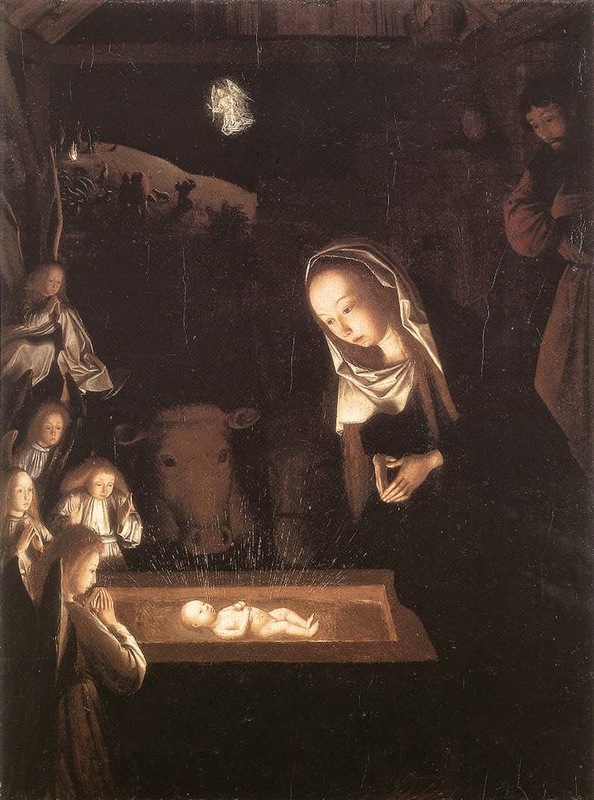 Animals are allowed to gaze at the holy child. They too worship. That’s the best part. Hardy’s poem expresses a nostalgia for the days of simple, literal faith. He doesn’t want anyone to tell him that the cattle are kneeling “in the spiritual sense”; what he’d really love to see is the literal cows and sheep literally kneeling down at midnight. Not spirit, not metaphor, but actual animals on their knees! A sign so obvious would make everyone devout. In one of his old-age poems, Milosz (who in some ways reminds me of Hardy) confesses that every time he’s in church, he fervently hopes for a sign — all the while knowing that no statue will nod to him or lift its hand. No adult would be so naive as to try to test the legend. Whoever made it up was careful never to remain in the barn at midnight on Christmas Eve. In spite of the last line, the word “gloom” signals the end of that hope for a miraculous sign. But at the emotional level, the yearning remains. “The Oxen” is a poem of longing for belief in the face of the impossibility of belief. Religious doubt tends to strike around the time of puberty, when the developing brain begins to question adult authority. I doubted immediately already as a child, during my first religion lesson, but then managed to suppress doubt simply because it was unthinkable that the nuns and the priests would lie to us. And yet, after my first religion lessons, I (along with all the other children, I strongly suspect) was filled with the question, If god exists, why doesn't he just show himself? Maybe he could open a window in the sky and show his face? Or at least say something? He did talk to Adam and Eve, and later to Abraham and Moses . . . Why not to us, now? One little boy was actually brave enough to [shudder] ask the nun just that: If god spoke to those people in the bible stories, how come he never speaks to us? The nun smiled in a sad way. Nuns didn't normally smile, so that sorrowful smile, her whole face and body language charged with melancholy, was striking and unforgettable. “Those were different times,” she said. “People were different back then.” End of explanation. In retrospect, I see that it was a perfectly good explanation. 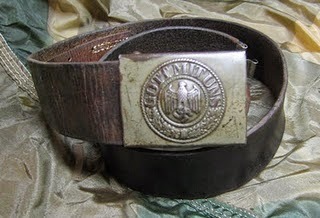 The times were different, as were people’s mentalities. The ancient world was filled with gods and demons, witches, dragons, unicorns, and other imaginary animals. Literacy was confined to the few, so stories were transmitted orally, evolving from generation to generation. Fantasy and reality were not clearly separated. Cynics might argue that that’s still true, but seriously — centuries ago, it was much worse. Hardy was raised as an Anglican. For a while in his youth he had a Baptist friend and was drawn to evangelical Christianity. But Hardy’s intellect was too powerful not to see that all religions were invented by humans. Later he became what could be called a “cultural Christian” — someone who admires Christian ethics, loves the church music and the more poetic passages in the bible, but who doesn’t believe in a personal god, much less in the divinity of Jesus. But this was a feeble hope at best. Hardy was closer to naturalism than to process theology. He often presented the world seemingly ruled by forces that might be compared to the capricious and sometimes cruel gods of antiquity (note the “President of the Immortals” in the last sentence of “Tess of the d’Ubervilles”). Though now and then he showed how much he missed the naive rural faith of his childhood, Thomas Hardy was, above all, a realist. Flying figures with long flowing beards are hard to resist. 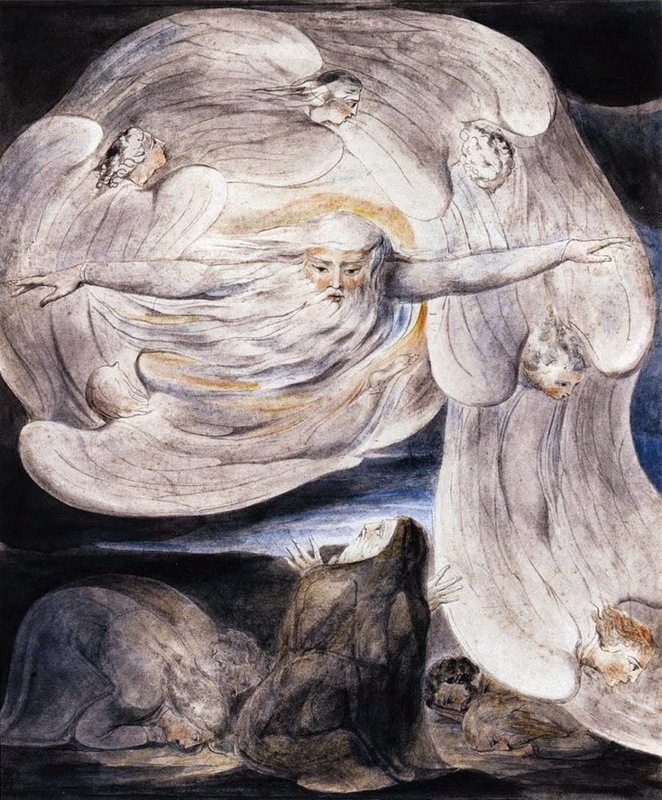 Since I already had Blake’s image, and also the one with St. Peter and St. James, I checked on the part of Dante’s Paradiso in which St. Peter and St. James appear, wondering if I’d find some beautiful lines to quote for my readers. Alas, I found those cantos dreadfully boring, the language flat and didactic rather than subtle and imagistic (“To be direct is to be inartistic” ~ Henry James). Paradiso seems to validate the theory that poetry too requires dramatic tension — what Blake called the “contraries” — and what may also be called “surprises” (“No surprise for the author, no surprise for the reader”). St. Peter examines Dante’s faith, asking about evidence. Dante gives the official scholastic proofs: first cause, the unmoved mover, etc. — and miracles. The scholastic arguments have all been invalidated. As for miracles, I’ve never read or heard of any that could be categorically ruled out as coincidence or natural healing. In fact Dostoyevski’s Grand Inquisitor condemns Christ for not having established undeniable miracle (a mere trifle like turning stones to bread would do) as the basis of religion, having instead condemned humanity to believe or not believe in the absence of convincing evidence for the supernatural. Actually I never understood why it would be so bad if god — assuming such an all-powerful and all-good being exists somewhere in the cosmos and cares about human beings — gave us some clear proof of its own existence. The usual answer seems to be: then faith would lose its merit because we’d have knowledge, and god prefers us to believe without proof rather than to have knowledge. If he provided evidence of his existence, then faith would not have the great merit that it has in the absence of evidence. Dostoyevsky’s argument (and we cannot doubt that he is on the side of Christ and against the Grand Inquisitor, even though he feels great sympathy for the old man’s attempt to provide emotional succor to the ignorant flock) is that an indisputable miracle would compel us to believe; we’d no longer have the freedom not to believe. Why is the freedom not to believe considered so precious? If millions of people all over the world would see the cattle kneel at midnight on Christmas Eve — or pick something else, given we don’t live around cattle as we used to — wouldn’t we kneel as well, filled with joy? I suspect many of us would gladly give up the freedom not to believe in exchange for the certainty of immortality. Would not such knowledge inspire dancing in the streets since we are headed for paradise? Or at least because someone up there cares? And wouldn’t religious wars cease since the whole world would have the proof as to which god is true? Is there indeed a single bad effect that such knowledge would have? Or, to drop the Christian slant, what if we indubitably witnessed the goddess Kali in her garland of skulls? Not as special effects, formed by laser beams projected on the sky, but dancing in the middle of Main Street? Terrifying as that would be, at least it would be proof of the spirit world. Actually, I can think of a bad effect of knowledge as opposed to faith, but it’s not one that the “flock” would see as bad. Namely, the earthly life would seem pretty insignificant next to the promised eternity of bliss, and earth itself only a pale shadow of the beauty in paradise. That was the official view during the Middle Ages, when the faith of many did approach the certainty of knowledge. 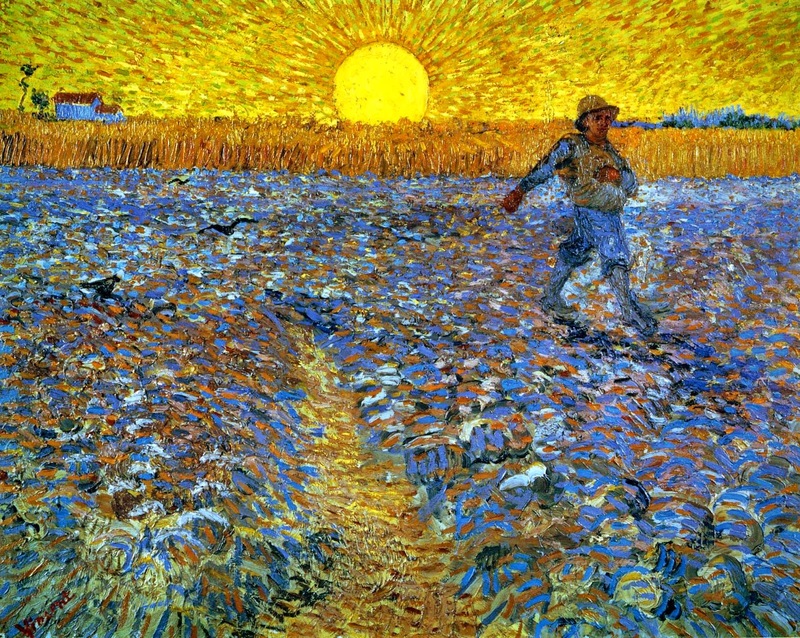 Consequently, those who hoped to hasten death through long fasts and self-flagellation, or spent most of their time in prayer, on their knees on hard stone, were regarded as role models — and not those who improved earthly life by designing a more efficient plow, for instance, or by devising laws that constrained a monarch’s tyranny. That any progress was made during the so-called Ages of Faith seems almost —“almost” — miraculous. Scientific inquiry was blocked. Once the totalitarian power of the church was broken, along with the practice of burning at the stake those who would question, or dare to translate the bible into a living language, the human mind could flourish again. That mind is neither omnipotent nor all-good, but the heights achieved by human genius fill me with awe. And the heroic deeds of human altruism — someone risking his life to save a stranger — also impress me no end. My allegiance is to that which is highest in humanity. Like Thomas Hardy, I could call myself a “meliorist” — one who believes that together we can build a better world. But I prefer to use a more familiar term: a humanist.